Lead your army of animals and birds in a great battle to control the sacred valley of Skyvale. The sacred valley of Skyvale is abundant in food and water. It is a haven where predator and prey can coexist in harmony. But all of that is about to change. Two rival Silverbacks, both of equal strength, are of the opinion that the valley should belong to the strongest of animals and they are not alone. Gathering their followers, both Silverbacks line their armies on either side of the great river that divides Skyvale in half. Where once there was peace and tranquility is now only war and chaos. Only one army will triumph, and when they do, Skyvale will never be the same. Skyvale, by Whirling Derby, is comprised of 1 fold out game sheet, 2 Silverback pawns (1 white/1 black), 6 Panther pawns (3 white/3 black), 12 Boar pawns (6 white/6 black) and 20 Eagle pawns (10 white/10 black). The pawns for each animal type are different and have a distinct Chess like feel to them. To set up the game, first place the game sheet in the middle of the playing area and orientate it so the river that runs down the middle of the game sheet is in between the two players, from left to right. Second, each player will take all the pawns of one color (20 of each). Third, the players will set up their side of the valley using the set up image guide in the rule book that shows where each of their pawns are placed (image provided here for visual example). Decide who will go first and begin! Skyvale plays much like Chess in the sense that each pawn has specific rule that governs its movement. Knowing how each pawn can move is crucial to game play, in the same way knowing how all the Chess pieces move. Unlike Chess, there are only a four pawns to learn. They are described here in summary. The Silverback is the “King” of the army the players will control. And like the “King” in Chess, the Silverback must be protected at all times. Unlike Chess, the Silverback is much tougher than the hoity toity “King”. Silverbacks are the players strongest and most capable pawn to utilize. The Silverback can move up 3 spaces on the Valley section and change direction at anytime during its movement. This allows the Silverback to deftly avoid conflicts or quickly find them, but the Silverback cannot move through the space occupied by another pawn. The Panther is as fast as the Silverback and able to move up to 3 spaces on the Valley section. Unlike the Silverback, the Panther cannot change direction while moving. However, the Panther is a lean and flexible creature which allows the Panther to “jump” over any pawn that is blocking its path, much like the “Knight” piece in Chess. A Panther cannot end its movement on a friendly space but can pounce on an unprotected pawn that belongs to the opponent. The Boar represents the player’s grunts and are the most numerous pawn on the Valley section. Boars can move up to 2 spaces on the Valley section and can change direction while moving. Like the Silverback, it cannot move through a space occupied by another pawn. The Eagle is the only pawn that will be located on the Sky section and serves two purposes. First, the Eagle is a protector. Animals on the valley floor can “call” the Eagle to assist it by offering, figuratively speaking, an eagle’s eye view of the valley. Each space on the Valley and Sky section correspond with each other (a helpful icon and number are on every space to help identify). If an animal pawn on the Valley section has an Eagle pawn on the Sky section that matches, the animal pawn cannot be attacked by any animal in the valley. Second, the Eagle is a warrior and fights other Eagles in the sky. Eagles are also the most difficult to use as they are dependent on another animal within the valley. An Eagle always moves in a straight line on the Sky section and can move any number of spaces in any direction (orthogonally and diagonally), but only to a corresponding location that matches an animal pawn on the Valley section and only if the animal calls it. The opportunity to “call” becomes available when the player moves their pawn on the Valley section, but is optional to use. Meaning, the player can choose to not call at all, leaving the Eagles to circle in the sky without a positional change. 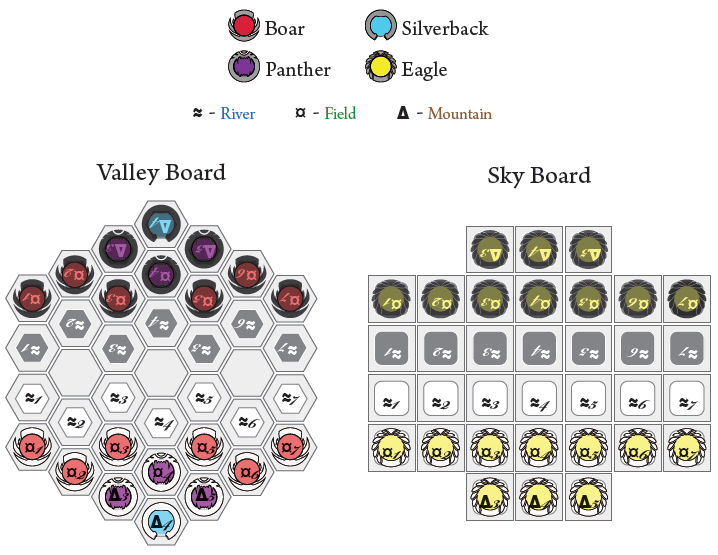 If the player does want to call an Eagle, they select one Eagle pawn on the Sky section and move it in a straight line to the corresponding space that matches the animals’ position in the valley. If the Eagle’s path is ever blocked by a friendly Eagle, its movement immediately stops. If the Eagle’s movement is ever blocked by an opponent’s Eagle, it captures the pawn and stops. If neither of these occur, the Eagle pawn continues until it reaches the corresponding space that matches the Valley section space directly over the animal pawn. But the player isn’t done yet. The player can choose to either leave the Eagle there, stopping its movement, and protecting the animal pawn on the Valley section from any attack from another pawn in the valley, or the player can have their Eagle continue to fly in a straight line until it hits the edge of the Sky section, hits a friendly Eagle, or captures an enemy Eagle. There is one exception to the rule of calling an Eagle. Located on the Valley section are three islands that are surrounded by the large river that cuts the valley in half. If a pawn ends their movement on one of these islands, they can call an Eagle, but the Eagle can move to any location it wants and in any direction. It does not have to go in the direction of the call, in other words. But it is important to note that Eagles cannot protect pawns located on the islands! The game is played with each player taking turns, moving one animal pawn on the Valley section and optionally moving an Eagle pawn on the Sky section. Once the player is done with their move, the next player goes. This continues until the endgame is reached. On a player’s turn, they can take the following sequential steps. As an optional first step, the player can “transform” a Panther or a Boar pawn into an Eagle pawn. The pawn on the Valley section is removed and an Eagle pawn is placed on the corresponding space on the Sky section. This is a one way trip, so to speak, and the Eagle is forever an Eagle for the duration of the game. The only limitation is that the space the Eagle pawn will be placed must be unoccupied. A player is required to move one of their pawns on the Valley section each turn. What pawn they move is up to them. When moving, the pawn must always end its movement in a new space. To put it another way, you cannot move a pawn in one direction, reverse, and return the pawn to its original position. If the pawn ends its movement on an opponent’s pawn that is not protected by an Eagle, the opponent’s pawn is removed. If the opponent’s pawn does have an Eagle, the player cannot move their pawn to that space until the Eagle pawn is either removed or moves. Note that a pawn on an island can never protected by an Eagle. Once the player has moved their pawn on the Valley section, the player can optionally call an Eagle pawn and move it to the corresponding space that matches the Valley section on the Sky section. Normal movement restrictions apply. However, if the player ends their pawn’s movement on one of the islands, they can move the Eagle pawn in any direction without the restriction of having to go in the direction of the pawn who called it. The game continues until one player captures their opponent’s Silverback, or if their opponent concedes. Both players should congratulate each other and then quickly reset the game sheet for another game! To learn more about Skyvale and read the full rules which includes several illustration that demonstrate pawn movement, visit the game’s web page. My little geeks have enjoyed Chess and they can play Checkers like champs. They are also familiar with games that play like Chess and Checkers, having no problems adapting to the different ways the pawns move. For example, Dragon Face. 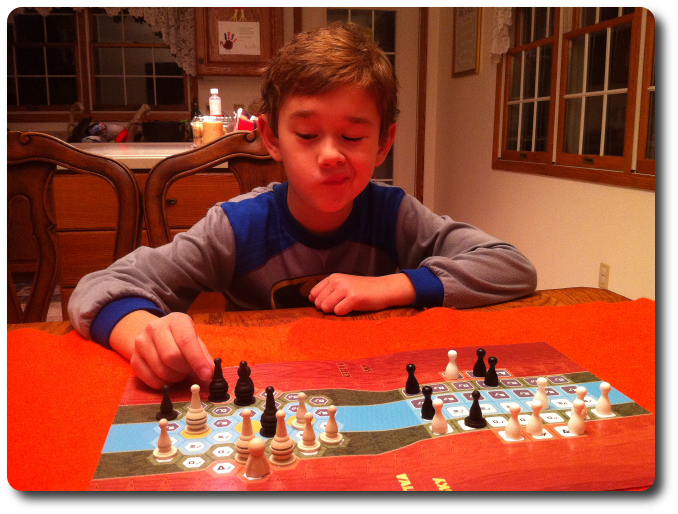 My 8-year-old is of course a stronger player, but my 5-year-old does very well if there is another player there to help him remember how pawns move. I don’t think Skyvale will be a problem for them to learn, but the new dual play area is going to throw them. They’ll have to think differently and need to consider what is above and below at all times. In fact, it is crucial to understand where every pawn is at in relationship to each other to play Skyvale competitively. While I don’t anticipate anything other than an easy learning curve, this new way of play will take them a bit to get used to. As far as the Parent and Gamer Geeks go, I don’t think they’ll have any problems learning and playing this game either. I predict the Parent Geeks will very much enjoy it as a 2-player family game, as it plays fast and is very casual. The Gamer Geeks are only going to like this game if they can see it has great depth, strategy, and tactics like Chess. If it comes across as Checkers with a bit more thought, they’ll reject it. And so, after I explained the rules to the game to my two little geeks, demonstrated pawn movement, went overboard on the differences and similarities of the Valley and the Sky sections, my little geeks were ready to play. As I set up the game sheet for their first game, I asked them their thoughts on Skyvale so far. Looks like my animal generals are ready to go! Let the final battle for the valley begin! The Child Geeks had fun with this game, but not at first. They were confused about where to place their attention. Do they focus on the valley or the sky? Lucky for them, and a brilliant bit of rules by the designer, the battlefield in the sky is an optional step, meaning it is also optional to use. During the first couple of games, the Eagles were barely touched except to fight other Eagles. The more games a Child Geek got to play, the better the Eagles were utilized. This was especially true when the Child Geeks played with Parent and Gamer Geeks, observing how they used the Eagles, and then mimicking what they saw. It didn’t take long until the Child Geeks started to utilize the Eagles fully, and their games improved dramatically for it. While my 8-year-old had no problem playing the game, my 5-year-old struggled. He was unable to split his focus in the game and became frustrated as a result. For all the other Child Geeks who were 8 or older, they had no problem learning the game over a relatively short amount of time. Parent Geeks had no problem learning how to play the game and were somewhat surprised how challenging the game could be. At first glance, Skyvale looks very simple. Little Chess like pieces, simple movement, and the basic objective of “take the opponent’s pawns”. Really nothing new or exciting to note. But when the Eagles were thrown in with the ability to protect the pawns in the valley, the game took on a whole new level of difficulty and depth. This eagerly made the Parent Geeks lean forward at the game table and they had a wonderful time playing the game with their peers and their family. They especially liked playing it with their Child Geeks because they could share and learn the game together. Gamer Geeks were rather surprised by this game. They were not impressed, at all, with the game when it came out of the box. After I explained the rules, they were somewhat more interested. After playing a full game, they were fully convinced it was worth their time. They very much enjoyed all the thought a player had to put into the game to play competitively. There was much to think about and do, but within a well-defined boundary that kept everything flowing at an excellent pace. What they could not abide, however, was the game sheet itself. They found it to be too flimsy. The pawns would sometimes slide off because of the slight curvature of the sheet, and the overall result was a drastically reduced level of enjoyment. Gamer Geeks, this game has depth, it requires strategy, and tactics to play competitively. Your peer group enjoyed it, felt challenged, and entertained in equal measure. Especially with the dual play sections and managing both ground and air pawns at the same time. So why isn’t it endorsed? Turns out the game sheet is to blame. It actually detracted from the game play because the game sheet tends to bend a bit causing the pawns to sometime not stand right or stay in place. This is easily corrected by either laminating the sheet or placing a clear piece of thick plastic over it. However, none of the Gamer Geeks agreed to approve the game on the grounds that it was fundamentally flawed based on the poor component quality. A worthwhile game, but poorly produced. Any game that you have to “fix” once you get it is not a game a Gamer Geek wants to endorse. However, they all agreed that it would be easy to endorse this game if the component quality was addressed. Parent Geeks were much more forgiving, and after I laminated the boards, mounting them on a thicker bit of board to give them stability, the game was played without issue. While the Parent Geeks did roll their eyes when they heard what I had to do to the game, they shrugged it off as nothing more than a worthwhile effort to make a fun game easier to play. The Parent Geeks had a great time playing Skyvale with their peers and their families. It was found to be a wonderfully creative and interesting alternative to Chess and Checkers, and the dual play sections very much drew them in. Non-gamers greatly enjoyed the game, too, making Skyvale a worthwhile exercise for everyone in the family. Child Geeks, your level of enthusiasm for this game shifted constantly. At first, you really enjoyed it, felt challenged but not overwhelmed with the dual play sections, and liked the fast play. Then you disliked the game as the pawns started to be removed, the Sky section became filled with angry birds, and your forces started to fall back. When the game was done, you either really, really loved it or really, really hated it. The level of love or hate for the game was directly related to you winning or losing the game. When the games were over and everyone had time to calm down enough for a rational conversation, your peer group decided the game was a very good one. Win or lose, you kept coming back to it. Your only negative comments was that the pawns were a bit confusing at first because they didn’t look anything like the animals they were meant to represent. I very much enjoy Skyvale and think it is an excellent alternative or replacement to Chess. The same level of thought and focus is needed, but the dual playing sections forces the player to think in multiple directions. This even took me a bit to get used to as my brain naturally wanted to only focus on the Valley section. But a player really can’t. In order to be competitive, you must use the Eagles. If both players use the Eagles, the battle that ensues for control for the valley is truly a difficult and challenging struggle. When I played with a skilled player, the skirmishes in the sky were just as active as the ones on the ground. I found myself looking back and forth from one section to another as one would follow a tennis match. Left. Right. Left. Right. Valley. Sky. Valley. Sky. This kept me fully engaged, constantly revaluation my strategy, and attempting new tactics. While I am much more forgiving than the other Gamer Geeks regarding the component quality, I think it would be an excellent idea to mount the game sheet on sturdier stuff then the currently used thick paper. I appreciate that there is additional cost to the publisher and the player, but that is a small price to pay to make a product’s component quality more durable and usable. My first impression of Skyvale was less than favorable when I opened the box and saw the very flimsy and folded game sheet. This negative first impression was something I had to work through and over, as did all the other players, which meant the game took longer for us to play, and consequentially, enjoy. Hopefully a redesign will be considered because this game really deserves a higher quality component upgrade. It also saddens me that the only thing keeping this inventive game from getting the Father Geek Seal of Approval is a simple component choice. Until the component quality issues are addressed, I have a hard time recommending Skyvale to others. The game play is excellent, the level of depth one must dig to come up with a winning strategy is sometimes staggering, and the many different tactics one must use to get the upper hand seems to be limitless. But I will stop short of telling someone to “get this game”. The game component quality leaves me with a bit of a sour taste in my mouth and makes me pause when I consider speaking about it to others. Despite this, and perhaps the most telling of all, I have spent money and time to “fix” the game sheet to bring it up to what I consider a reasonable component quality standard. By doing so, my games are more fun, the game itself is more durable, the pawns don’t slide, and I am able to focus on the experience versus being nagged by the faults. And the experience is most certainly a good time.